A $25 billion Department of Energy loan program responsible for federal investments in fuel-efficient automotive companies like the struggling carmaker Fisker has not closed a loan in two years. As of January 29, 2013, "DOE was not actively considering any applications for using the remaining $16.6 billion in loan authority or $4.2 billion in credit subsidy appropriations available under the ATVM (Advanced Technology Vehicles Manufacturing) loan program," the GAO’s Frank Rusco wrote. The Energy Department told auditors it had seven ATVM applications on file, totaling $1.48 billion. But those applications were "inactive," DOE said, "for reasons including insufficient equity or technology that is not ready." "DOE is not likely to use the remaining ATVM loan program authority given the current eligibility requirements," the GAO said. The public failure of solar company Solyndra, a recipient of more than $500 million in government loans, has created problems for the loan program, according to CPI. President Obama famously promised to put 1 million electric vehicles on the road by 2015 in his 2011 State of the Union address. Fisker, whose co-founder departed the company last week, has struggled in the wake of the October bankruptcy of A123 Systems, Fisker's battery provider. A DOE grant recipient, A123 was purchased by Chinese firm Wanxiang America. 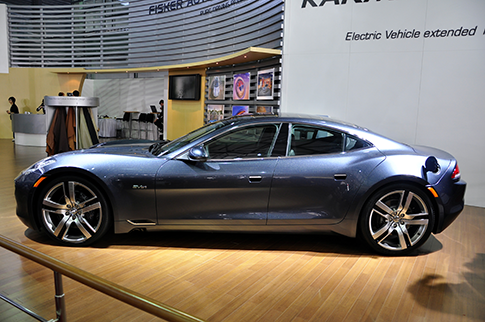 Fisker is reportedly entertaining bids from Chinese investors to rescue its stalled operations. Automaker Tesla announced last week it will repay its federal loans by 2017 — five years ahead of schedule. The company has faced a recent glut of unwelcome news, including poor reviews, order cancellations, and delayed production on the company's Model X crossover vehicle. This entry was posted in National Security and tagged A123, Department of Energy, Fisker, Obama Administration, Tesla. Bookmark the permalink.